We cordially invite you to read about the interesting description of the powerboa DOCA D-S8000. 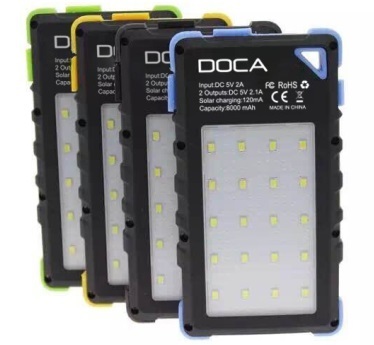 As with all DOCA energy banks, the discussed device is also very well done. Holding this equipment in hand, we get the impression that we are dealing with a professional accessory. However, once we start using the charger, we are already sure that this equipment can be called fully professional. The additional advantage of this device is the fact that portable phone chargers have a large lamp. A few words how to operate the DOCA D-S800. 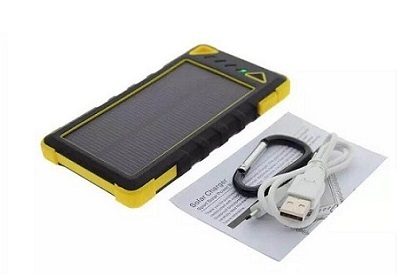 The solar charger is a very easy to use device when you want to charge it simply insert the cable into the charger microUSB socket, while the second cable to the charger or computer. To charge the battery bank, insert the cable into the USB port and connect the other end of the cable to the charging device. Loading this type of power banks takes about 8-10 hours. The LEDs that are built into the device inform the user about the amount of power in the device. The device has four LEDs, so one LED indicates 25% of its energy. On one of the sides is placed large lamps, has two ranges of light and can be turned on flash mode. Another interesting feature of a solar charger is the authentication of banknotes, for example. This model of energy bank also has a UV lamp. Note, the device is electric, so keep them away from young children. Also, do not light UV directly into your eyes. Portable chargers work well for any trip. Whether you are camping for your own garden, going to the mountains, or going to the desert, this type of device is essential in such situations. The device, when full, will double your phone.